Each business is unique and must be treated as such. 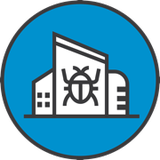 Our technical experts are ready to customize a pest management solution to meet your needs. Our expert staff is expertly trained and certified to remediate pest problems for a host of commercial customers. We’ve had years of commercial experience working throughout Atlantic City hotels, businesses and other commercial locations. We also are licensed and perform pest control in nearby cities throughout Atlantic County (Zip Codes 08401, 08402, 08403, 08404, 08405, 08406). Whether you're a small business or a towering hotel, Anchor Pest Control has the right control solution for removal of termites, bed bugs, roaches, mice, rats, and any other pests. Ranging from pest remediation to an annual pest control program, our services are always tailored to meet all of your needs. For a complimentary pest identification, damage evaluation, and/or a free pest consultation give us a call at (732) 636-8761 today. We provide monthly, quarterly or a 6 month service plan, each includes preventive maintenance on all non-wood destroying insects and excludes bed bugs. It includes treating the inside and outside of your building as well as a complete pest inspection. All warranties apply only while the contract is active.